I really liked the Grisha-verse, so I hoped the Six of Crows duology was a great as the trilogy. I found it was a bit less satisfying and it sounded a lot like The Lies of Locke Lamora which I read a month earlier. I give Six of Crows by Leigh Bardugo four out of five hearts because I found it too similar to The Lies of Locke Lamora by Scott Lynch and not as great as The Grisha trilogy. The story is well written, I did not find any great loop holes and such. The characters were great, but just like the story very similar to The Lies of Locke Lamora. It all just kept reminding me of that novel and that kept me from completely enjoying it. It did have a different kind of humor than the later and this also did not work well for me. I still like the Grisha-verse. The magic system and such is great and original. As goes for the world. I really liked Inej aka The Wraith because she was a new character to me (as I said before most of the other characters just sounded so much like those in The Lies of Locke Lamora) and she is interesting because of her powers and background. The rest of the characters weren’t that memorable, but they were okay guys. 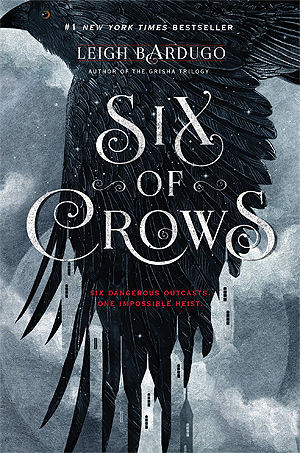 Even though Six of Crows disappointed me a little bit, but the story is fine and the characters were okay. I love the Grisha-verse and would love to read more in this world. This entry was posted in Book Review and tagged Adventure, Book Review, Fantasy, Leigh Bardugo, Mystery. Bookmark the permalink.